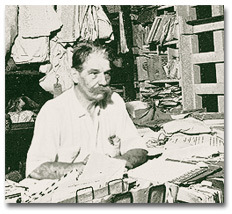 Albert Schweitzer once remarked in conversation, “I think that the most important trait in a religious worker is complete devotion to the truth.” The remark summarized the characteristic quality of Schweitzer’s own life. When he was a popular teacher and theological professor in Strassbourg, he wrote books on New Testament criticism which reflected his complete responsiveness to the demands of scholarship and his unwillingness to allow personal feelings or hopes to interfere with his passion for the facts. As a writer on Bach and editor of his organ works, he has emphasized the objectivity needed for the correct interpretation of Bach. To hear Schweitzer play is to forget Schweitzer the performer and even Bach the composer, as the eternal musical forms which Bach caught and set down on paper flow into the mind of the listener. 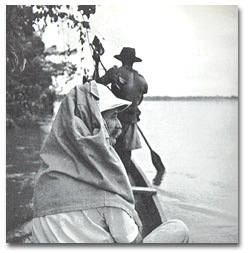 Furthermore, Schweitzer’s life as a medical missionary in equatorial Africa testifies to his supreme concern for the abstract ideal of justice and his unwillingness to let private ambitions stand in its way. When asked why he went to Africa when a brilliant career in Europe was open to him, he replied very simply that the black man had been exploited by the white long enough and that it was time to try to even the scales. Now that the white man has developed the science of medicine it is only decent that he should share it. If I believe this, he added, I should go myself and not leave the job to others. In his books on ethics he comes to the conclusion that “reverence for life” is the supreme moral rule. In one sense this puts him in the class of Lebensphilosophen or thinkers like Nietzsche who find in the will to live the clue to what is most real and important. But for Schweitzer the will to live does not lead to the will to power. “I am life that wills to live,” he says. “and as I examine this will in myself I become aware of its presence in others.” For him the will to live thus becomes the will to love. In this way Schweitzer has effected a remarkable personal synthesis of the two main tendencies in German philosophy, one with its emphasis on spirit, form, and reason, the other with its stress on living instincts, and has shown also how they can be set to work for society. 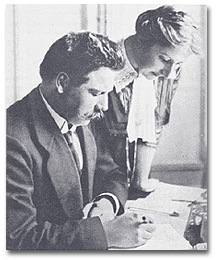 Dr. Schweitzer and his bride in 1913. In Schweitzer’s life it is true not only that various interests combine to form a harmony but also that they separate again to produce a most extraordinary variety of accomplishments. Is it not fair to say that he is the most versatile genius of our time? He is a skilled concert organist, whose records are well known in this country, and an authority on organ construction. His life of Bach is still definitive in its field, as is his edition of Bach’s organ works. He has published books on ethics, on New Testament criticism (where his ideas still have to be reckoned with by all writers on Jesus’ apocalyptic teaching), and on the history of religions with special reference to India. He has not only taken an M.D. 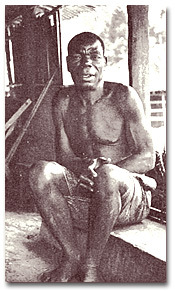 degree and become a practicing medical missionary, but has set up a research center in Africa where his associates have isolated the germ of one of the dreaded tropical diseases. Now at the age of sixty-seven he keeps up his work in Africa, healing, teaching, preaching, writing, and continuing to practice on his organ. His friends have urged him to come to America, and offers of lectureships and recitals have literally poured in to the committee which wished to arrange for his visit. He has always promised that he would some day come, but since the beginning of the war has steadfastly maintained that he would not leave his African neighbors and force them to carry on without him in a period of such great stress. 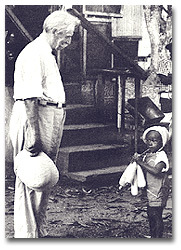 During the first world war Schweitzer was interned in Africa and his hospital practically fell to pieces. After the war he toured Europe, giving lectures and recitals which brought enough money to start anew and on a sounder basis. In a day of complete political anarchy he gives us a picture of the kind of international unity that the spirit of love can bring about when it works with devotion and intelligence. 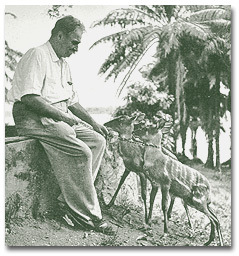 A German Alsatian in a French Protestant mission in equatorial Africa, he is supported by money raised in England, Sweden, Norway, Denmark, Switzerland, Spain, Canada, and the United States. 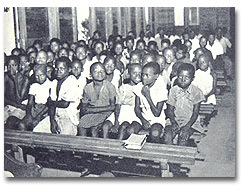 Is he not a prophet and teacher with a message for us as truly as for the Africans to whom he ministers? — By J.S. Bixler, President of Colby College, from The Christian Register, April 1942. Drawing by Gunther Flatlow in 1955. 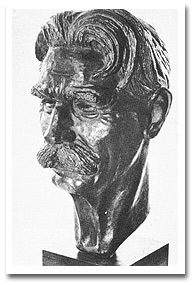 Bust of Albert Schweitzer by Leo Cherne. “In my effort to get away from intricate Christian theology based on later interpretations, I developed some ideas of my own. These ideas were at variance with the ideas that had been taught me. Now, what was I to do? Was I to teach that which I myself had been taught but that I now did not believe? How could I, as the principal of a seminary, accept the responsibility for teaching young men that which I did not believe? “But was I to teach that which I did believe? If I did so, would this not bring pain to those who had taught me? — From the archives of the Andover-Harvard Theological Library. I would like to thank you for your kind letter of June 14, 1945. Thank you also for the “History of Unitarianism” by Dr. Wilbur which you are sending me, which will give me information about the history of Unitarian Churches in the United States. This book has not yet arrived. Excuse me for not writing you in English. It is so much easier for me to write in French. At present I am very busy trying to find two doctors and four nurses in Europe to replace those who have worked with me here during the hard war years. 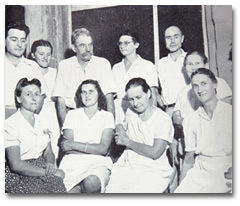 I have already been able to bring a nurse from Alsace, who had formerly been here at my hospital. Also, I believe that a young doctor, son of an Alsatian pastor (whom I knew well) will decide to come. A nurse in Switzerland (who, like the Alsatian nurse has worked here before) is ready to come. But so far she has not been able to, either by boat or airplane. We are still cut off from the rest of the world! Only the mail is beginning to function more or less normally. When the new personnel has finally arrived, I shall start them off in their work, for to conduct a hospital in the midst of a virgin forest is not a simple thing. Therefore it will be a matter of months before I can think of returning to Europe for the rest I need so much. At present our activities here are complicated by a famine which has prevailed since the end of summer, because of the failure of the crops planted in the summer of 1944! Luckily I had foreseen that this was going to happen , and when, in the spring of 1945 there arose an unhoped for and unique chance to buy rice, I bought, using for the most part your generous gift for my seventieth birthday, all that I could procure in the way of rice. And it is this rice which has helped us to weather the crisis. Otherwise it would have been necessary for some time (until the crops planted in the summer of 1945 begin to produce) to turn away the patients who should be hospitalized! You can well imagine how I think of my friends in the United States daily, and in particular of the donors of the wonderful gift collected for my seventieth birthday by the Unitarian Service Committee, with feelings of deep gratitude. . . .
My wife sends you her greetings with mine. 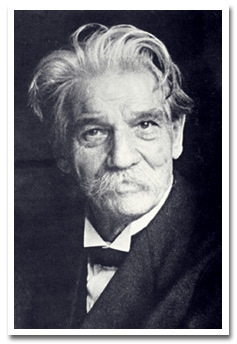 Albert Schweitzer was an honorary member of the Unitarian Church of the Larger Fellowship. 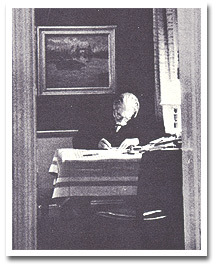 Dr. Schweitzer at his writing table. Statue of Dr. Schweitzer in Riverside Church. At the organ in the Gunsbach Church. 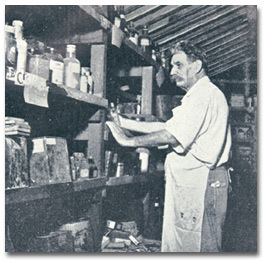 Schweitzer in 1949, at age 74. The Black African statue by Bartholdi at Colmar. 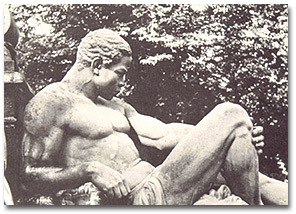 It was Schweitzer’s strong and sustained emotional reaction to this statue as a boy and a young man that helped motivate him in making the commitrment of his life to Africa. 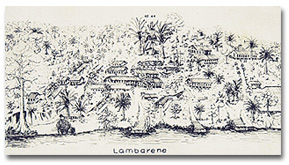 The handwriting reads: ‘Lambarene.’ To Dr. Ostergaard-Christensen and his wife in memory of three months (6.9 to 6.12.58 at Lambarene. 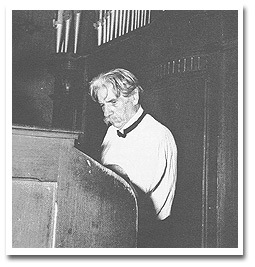 Schweitzer the musician listening to recordings of his organ interpretation of Bach. He was respected both as an organ builder and a concert performer, and many of his funds for the Lambarene hospital were raised by organ recitals he gave thoughout Europe. 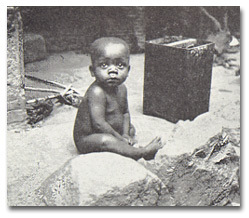 A young visitor to the Lambarene hospital. 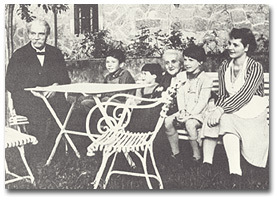 Schweitzer with his wife, daughter Rhena, and grandchildren in 1951. 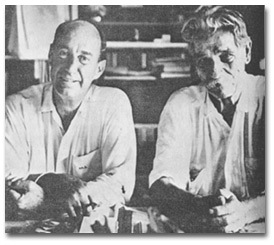 Schweitzer with Adlai Stevenson. Courtesy Boston Public Library Print Department. 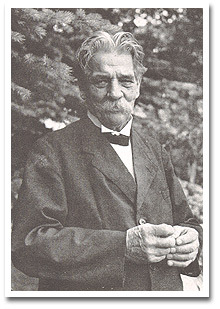 At Work With Albert Schweitzer by L. Ostergaard-Christensen, translated by F .H. Lyon (Boston: Beacon Press, 1962). 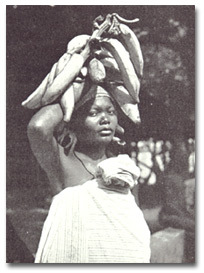 The Africa Of Albert Schweitzer by Charles Joy and Melvin Arnold (New York: Harper and Brothers, 1949). Schweitzer: A Biography by George Marshall (New York: Doubleday and Company, 1971). 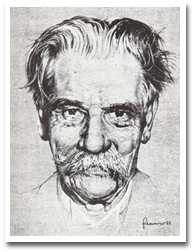 Albert Schweitzer: The Man and His Mind by George Seaver (London: Charles Black, 1955). Schweitzer, Albert. Out of My Life and Thought: An Autobiography . New York: Henry Holt and Company, 1933. 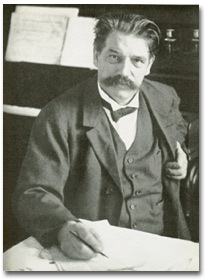 Schweitzer, Albert. 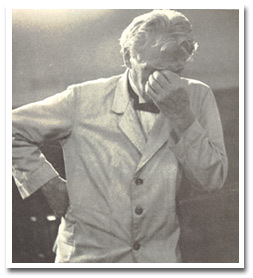 The Philosophy of Civilization by Albert Schweitzer. New York: The MacMillian Company, 1960.